For most projects, admits VernerJohnson‘s Jonathan Kharfen, architects steer clear of evoking a potentially destructive force like fire. 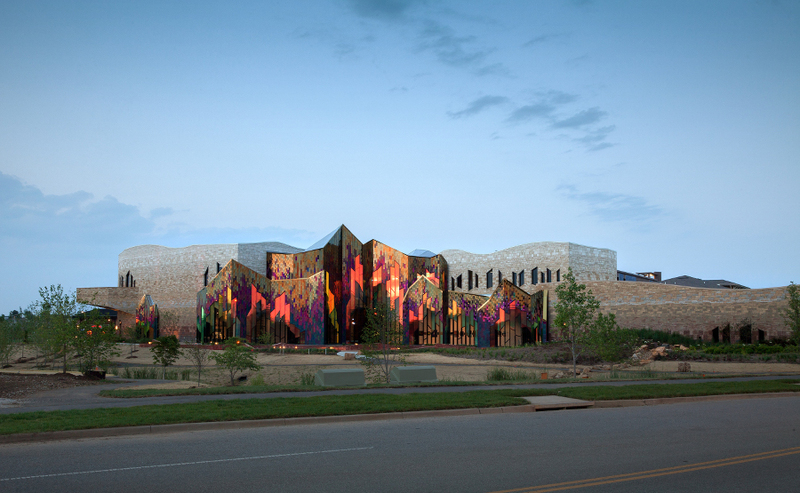 But Museum at Prairiefire, the American Museum of Natural History (AMNH) outpost in Overland Park, Kansas, proved an exception to the rule. Because Prairiefire houses AMNH’s traveling exhibits, its content is constantly changing, and thus provided little guidance in terms of an overarching design concept. Kharfen instead looked to the location. “What is the area about?” he asked. “For me the first thing that came to mind were the prairie burns. Coming from Boston, I’d never seen anything like it.” Using dynamic materials including dichroic glass and iridescent stainless steel, VernorJohnson crafted a faceted high performance envelope that embodies the color, movement, and regenerative power of fire. Not long after landing on the fire metaphor, said Kharfen, “I knew of a couple of materials that would be perfect, because for me it’s all about movement and light.” He began researching dichroic glass, a composite glass that changes colors depending on the angle of view. The museum’s sustainability goals—the project is targeting LEED Silver—dictated that the material would double as an insulating unit, the first such application in the United States. But that presented an additional challenge, as products with the dichroic properties embedded in the glass itself would break the budget. 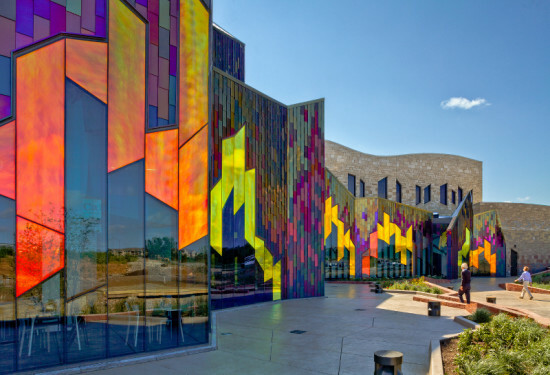 To lower costs, the architects collaborated with fabricator Goldray Industries to design an assembly incorporating dichroic film from 3M. The solution turned out to be an aesthetic boon as well as a cost-cutter, as the film itself carries a flame-like pattern. “It’s subtly dimply, it’s animated, it’s beautiful,” said Kharfen. 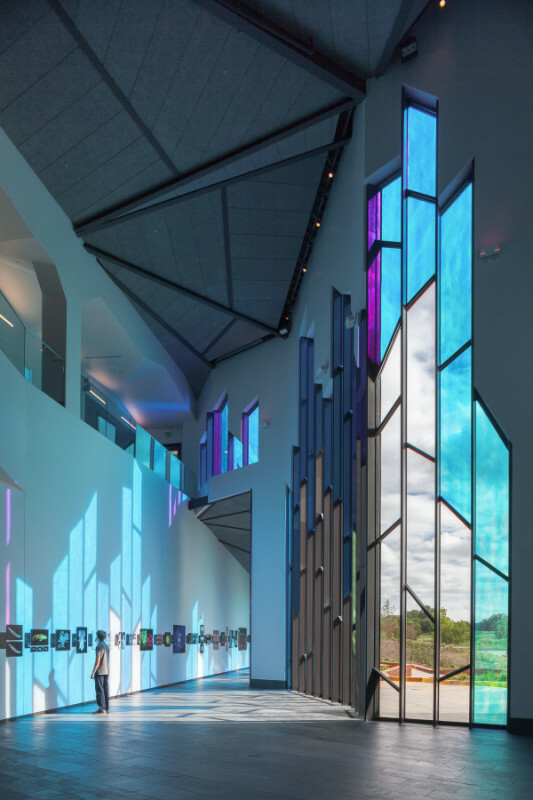 Kharfen’s team paired the dichroic glass with a second shape-shifting material, Light Interference Coated (LIC) stainless steel, ultimately applying panels in a variety of color and finish combinations. “With the stainless steel, I wanted to create [the appearance of] flame bursts and sparks,” explained Kharfen. “I didn’t want to apply it in a random way.” Instead, the architects arranged the panels in a gradient, with blue (near the bottom) giving way to burgundies and reds and finally to golden yellow. For Kharfen, it was not enough that the materials themselves convey a sense of life and movement. “I wanted them to be dynamic shapes, dynamic in plan as well as in elevation,” he said. His solution—a faceted curtain wall—upped the project’s technical ante. To avoid cluttering up the lobby space with columns, Kharfen worked with structural engineers Structural Engineering Associates to design a custom support system of stainless steel tubes fronted by angled mullions, to which the curtain wall is attached as a veneer. To accommodate the 14 unique angles involved in the faceting, curtain wall manufacturer Kawneer developed a new adjustable mullion, a hinged plate with a 180-degree range of movement. Given the museum‘s ever-changing content, the architects treated the exhibit spaces as “black boxes,” said Kharfen. 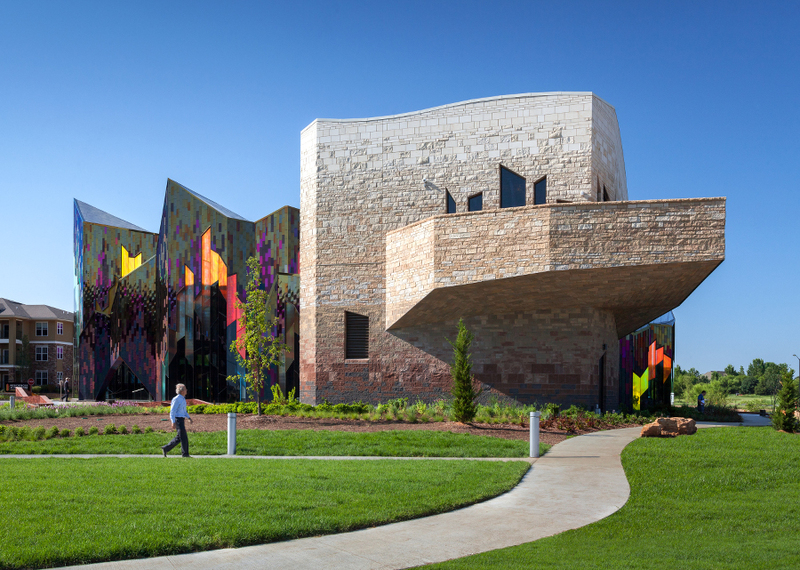 “For the solid areas I wanted to evoke the overlapping, curved forms of the hills.” The client, Fred Merrill of Merrill Companies, loved the stonework at VernorJohnson’s Flint Hills Discovery Center in Manhattan, Kansas, which suggests striated rock formations. “He asked, ‘Can’t we just do that here? '” recalled Kharfen. “I said, ‘No, we’re going to do something different.’ I wanted a gradient.” To cut costs and simplify installation, the architects whittled a more complex scheme down to a mix of two different stones in each band, with the bands varying in width. Again, the referent is fire: the walls begin with a charcoal-colored architectural cast stone before moving through Kansas limestone in shades of red, brown, gold, and off-white.